What does one look for in a city car? Good visibility, ease of parking and at least some general zippiness, I would assume. Massive amounts of horsepower, probably not. 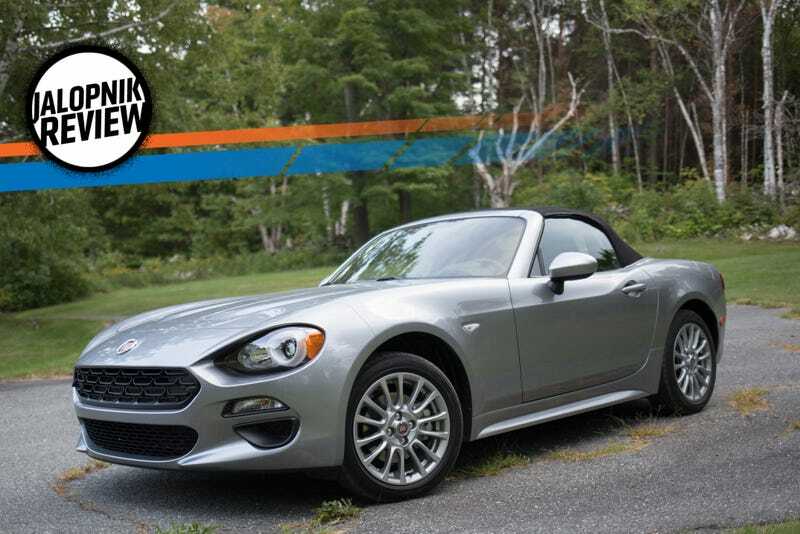 Curiously, though, the concepts of a “city car” and “Fiat 124 Spider” didn’t merge until I was done driving it in decidedly un-city places. According to Google, to get from the Jalopnik office in Manhattan to my apartment in Brooklyn, it usually takes about 17 minutes. This is a lie. Including the traffic across the bridge, which almost always exists, it takes about an hour. I didn’t mind, though: I had a new six-speed convertible to play with. The Fiat’s cloth top is powered by a motor known as Your Arm. The speed at which it goes up or comes down depends on your reach and how strong you are. Sitting in traffic with the top down—and knowing that you can put it up at a moment’s notice—is empowering. See, if you’ve never driven in New York City before, you really only need to know that at any given point in time, you will face off with SUVs, taxis, Ubers, Lyfts, duallys, moving trucks, moving vans, cars, limos, crossovers, semi-trucks, dump trucks, motorcycles, tricycles, mopeds, bicycles, scooters and pedestrians, to name a few. And you need to keep an eye on all of them because they are all potential traffic collisions waiting to happen. You really notice the size of a semi-truck when it’s towering over you in the neighboring lane when you have the Fiat’s top down. Buses are loud: a scream from the pressure of their brakes shoots through your eardrums. Motorcyclists cracking their knuckles at the red light could be your passengers. But here’s the thing: you’ll always hear them coming. And by virtue of the roofless nature of the car, you’ll also almost always see them as well. But I had somewhere to be: Vermont, 250 miles away. So, we packed up the little car and hit the road. I put close to 800 miles on the Fiat that weekend. We kicked it through open stretches of highways, up curvy country roads and had it climb a small mountain via an unpaved path. It did all of those things pleasantly enough, without complaint. In fact, the loudest complaints came from me, because the cloth seats were the most unbelievably uncomfortable ones I’d ever spent a long amount of time sitting in. For the first hour or so, the seats were fine, if only a little cramped. But when you go on a five-plus-hour road trip, they become damn near unlivable, forcing you into a hunch-backed posture that sent zings of tightness thrumming down the muscles of my back. As we crossed back into the city limits at the end of the weekend and the buildings loomed up around us like parted waters, I realized that—extraordinarily, remarkably—this was the place where I enjoyed the Fiat the most. Driving it out in the country diminished it to any other unimpressionable small car. It stood stubbornly at Fine Car With Very Bad Seats. But in the city, man, that’s where it shone. Can it fit in that gap that just opened up there? Yes! Are you constantly aware of everyone and everything around you? Yes! Is it darty and responsive to snap decision-making? Yes! A car with large overhangs is really a terrible idea if you are driving in the city. I know this because I drove a Mercedes-AMG S63 out of Manhattan once and I think I aged five years from the ordeal. The S63 is a massive car, making it about as useful in the city as a sledgehammer in a china shop. The Fiat, on the other hand, is a dream. In fact, it achieved the Smart ForTwo’s city car abilities (which were articulated to me during the ForTwo Cabriolet drive) better than the ForTwo itself did. It still fits two people, but has way more trunk space—enough for a weekend, plus some supplies and groceries. That is the equivalent of drawing abs on your stomach with a Sharpie. But I digress. The 1.4-liter MultiAir turbocharged engine has enough power, 160 horses, to merge and close gaps, but not too much that you might smash into the taxi that’s stopped short suddenly in front of you. Rather than a battleground, the Fiat transforms the city streets into a playground. Maneuvering becomes a dare and getting to where you want to go feels like cheating, somehow. I will also freely admit that I didn’t experience the manual in that Smart ForTwo, only the DCT, which was dreadful. The Fiat was fitted with a six-speed and it was wonderful. Power when and where you needed it. As you would expect to hear about a manual. In the Classica trim, the Fiat I drove would cost $27,285. So, more expensive than a ForTwo. But think about how much more car you get. Think about how much more fun you get. And with rent rising the way it is in the world’s cities, you might as well capitalize on a little extra space on the roads while you can.